Your tiles might be durable and functional, but if you are not using grout and tile cleaning services from professionals, then it can be difficult to keep it clean and hygienic. Tiles may have mildew and mould, which can get spread across and make your bathroom and other areas with tiles look ugly. Also, mould is a house of bacteria and other infections. Thus, it is preferable to use professional tile and grout cleaning service. It becomes more crucial for corporate offices, hospitals, schools and similar buildings that host a lot of different people in a day. If you think normal tile and grout cleaning will be enough, let me share the top 5 reasons to use professional tile and grout cleaning services to prove you otherwise. 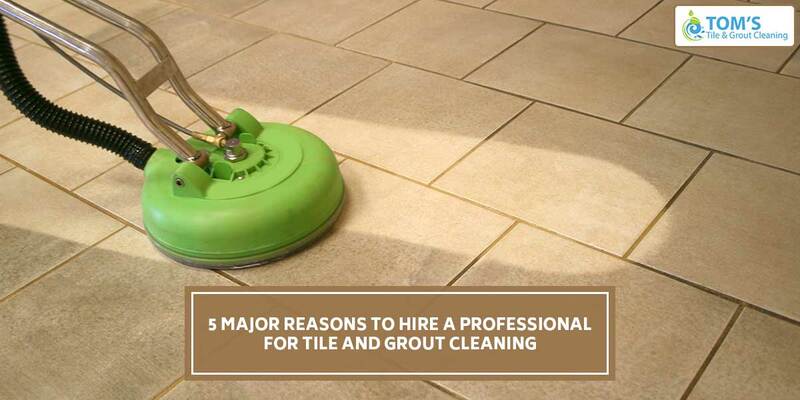 Top 5 Reasons To Hire a Professional Tile and Grout Cleaning Services. Mould and mildew are two serious problems and it must be cleaned at early stages until and unless you want to deal with a serious infestation of mould. The professional tile and grout cleaning will include complete grout and tile cleaning with the use of the best and environment-friendly tile grout cleaners. The technicians will clean the tiles in a procedural way to assure the mould is removed as well as it is prevented to come back after a certain time span. We use tiles to enhance the appearance of the bathroom and other rooms. Deprivation of tiles because of mould will make the tiles look disgusting as well as give it a bad smell. The tile and grout cleaning services performed by professionals will assure to kill the mould from each nook and corner as well as it will clean the tiles to give them a brand new look. The employee sick leave ratio is quite high in Australia. Generally, the employees catch an infection due to unhealthy and infective office environment. The professional tile and grout cleaning will remove all infectious bacteria, fungi, mildew and mould from the tiles. This will assure the office staff, as well as visitors, will have a hygienic environment. When the tiles start getting smelly and dirty, a majority of time owners start thinking about its replacement. However, you don’t need to spend money on it. You can use the tile and grout cleaning services offered by the professional service providers. This will not only make your tiles look new, but it will also expand the lifespan of your tiles. Thus, you can use the same tiles for some more years. There are many companies that offer same day grout and tile cleaning services. You can use these services to get your tiles cleaned on the same day. Also, the professional tile and grout cleaning Melbourne are highly flexible and convenient. The technician will perform the job, according to your schedule and need. You don’t even need to lift a finger while they perform the best grout and tile cleaning for you.